d4 Caltrops: RC Hacks and House Rules: Page 249 - Artifacts! I’m tempted to hook this into that bit at the end of B2 and turn the Keep into the first stop on an arching artifact-based adventure path. Who could forget that shapely prisoner imprisoned in the Caves of Chaos? With WoAdWriMo rapidly approaching, I'm being bombarded with ideas from every direction. Hopefully I can stick with one long enough to contribute this year. As an aside: I’ve always had a soft spot for Medusae, but I definitely tend to portray them as much more classical, breathtakingly beautiful and sinister foes in my games. I really prefer this to the depiction they were given for 3rd (and carried over for 4th, unsurprisingly) edition. I like to go with the "cursed by the gods" for their beauty and hubris angle a little more I suppose. Here you have an amazingly gorgeous woman, and a mere glance at her will turn you to stone. Avoid the gaze, and you've still got the copperhead coiffure to contend with. 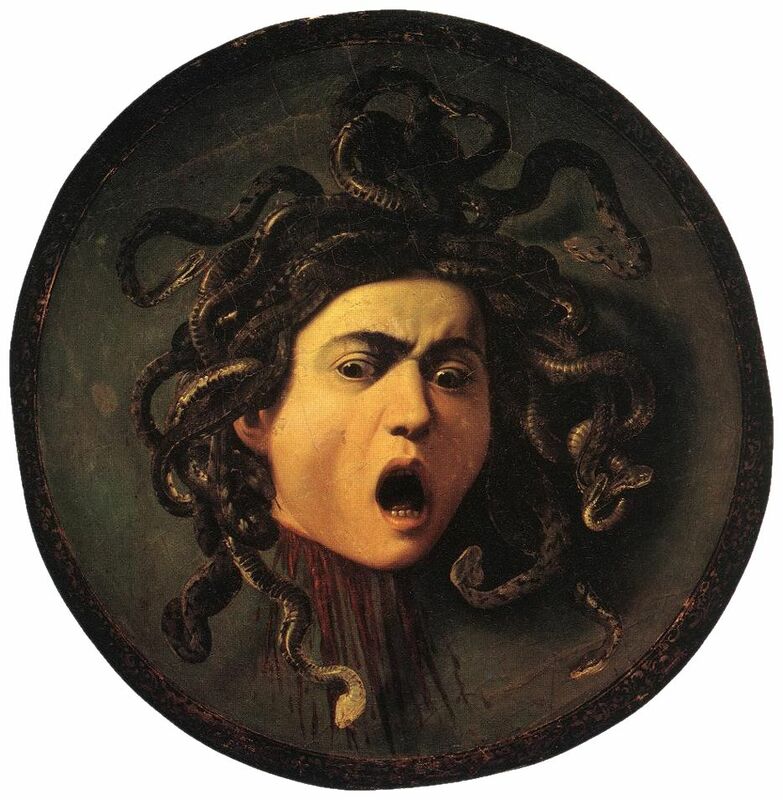 Granted, it's really hard to argue with the awesome-ness of the serpentine Medusa from Clash of the Titans, and I also did enjoy Jeff’s Medusae (adapted from Marvel Comics), but when I think about Medusae, my brain instantly links to Caravaggio's depiction. But back to our sheep, the system of Handicaps and Penalties outlined here is an interesting guideline, although I must confess, I'm pretty prone to shoving tiny magical quirks on virtually any magical item that my player's get their grubby hands on. This helps reinforce the idea that magic is unpredictable, and honestly, no two plus two swords should really be identical. The Handicaps associated with artifacts look pretty brutal, but the Penalty-per-use seems like a pretty way to balance an effectively limit-less spell casting item. I think in most cases, owning the artifact is enough of a problem as it is, and in the case of the Mask of Bachraeus, the players would probably have to contend with a rather perturbed nest of Medusae1, eager to get their precious artifact back. This artifact will shatter irrevocably if its gaze is ever reflected by the Golden Mirror of Ka. 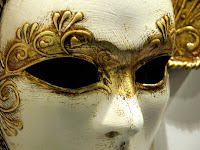 The wearer of the mask will be immediately stunned for a full turn and will remember nothing of what he did while wearing the mask, but he will be otherwise unharmed. Aspiring DMs are given a springboard for the creation of their first artifact, within the description of the sample artifact! Golden Mirror of Ka you say? The one that was lost when Milenia was sacked and razed by the Bogdashkan Orcs? Anyone care to take a crack at stat-ing the Golden Mirror of Ka in the comments? If you do, feel free to also provide a page number of the RC for me to tackle next! 1. Medusae need a collective noun. In searching for a suitably snake-y noun, I did come across a rhumba of rattlesnakes, which is great. "Medusae need a collective noun." Hmmm, none of these convinces me, and herpetolith turned out so much better in concept than in practice. If something springs to mind I'll let you know. I don't have a copy of the RC, though I've been eyeing them on eBay -- one of the more costly of the OOP D&D books though. Max, I think you can get the Rules Cyclopedia on .pdf from a few sites. I know it isn't quite the same, though. I recently saw a copy for about 12,000 yen in a second-hand book shop. That's US$120! And it wasn't even in good condition. The price inflation is presumably partly to do with the fact that this is in Japan. But still.